The 2018-19 slate of directors was confirmed at the Bowls Canada Annual General Meeting on September 23, 2018. All positions were elected by the members (Provincial Bowls Associations) who were represented by their Presidents or official designates. Incumbent Jennifer MacDonald (Calgary, Alberta) will resume her role as Secretary for another two-year term and fellow Calgarian Kathryn MacGregor will transition from her Director role to fill the remaining one-year of the Vice President term (formerly held by Ian Howard). About Bowls Canada BoulingrinBowls Canada Boulingrin (BCB) is the governing body responsible for lawn bowls in Canada. The BCB mission is to advance the sport of bowls in Canada. For more details on Bowls Canada Boulingrin and the sport of lawn bowls, visit www.bowlscanada.com. 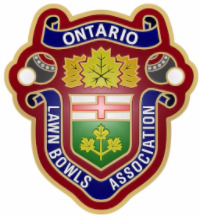 The Ontario Lawn Bowls Association would like to thank Charles Roach (Burlington) and David Koert (Stratford) for stepping forward to serve as directors on the board to cover the vacancies left by the departure of Wayne Harding for health reasons and Ian Howard after his election as BCB president. Charles Roach is a former board member and member of the Greens Committee and he will head up the Greens portfolio. He is also heavily involved in Burlington LBC's hosting of the 2019 Canadian Major Championships. David Koert is a relatively new bowler who will be stepping forward to take over the Communications portfolio which includes this newsletter and the Annual publication. After a tough three days of competition, the biennial North American Challenge has come to a close.The third and final day saw heavy rains soak the artificial carpet of the Laguna Woods Lawn Bowling Club. Players on both teams struggled through the rain to try and claim the seven coveted trophies.On the Men’s side, it was a sluggish start for the singles players. Both John Bjornson (MB) of Team Folkins and Owen Kirby (ON) of Team Jarvis started out 0-2. In the final game, Bjornson lost a tough one, while Kirby won a thrilling 28-end match. In the Men’s Fours, the Jarvis team of Cam LeFresne (NS), David-James Smith (QC), Carter Watson (SK), and Erik Galipeau (ON) worked out some kinks in the first match before putting up a great fight in game number two. Despite their best efforts, they came up two points shy to go 0-2. In their last game, they had all cyclinders firing and finished with a win. The Folkins squad of Greg Wilson (AB), Braeden Campbell (NS), Rob Law (MB), and Brandon Watson (SK) absolutely crushed the Americans in the first two games, winning 22-4 and 29-5. In the final game, they were in for a tighter match as the Americans handed the Folkins foursome their first defeat in a 14-12 match.In the Women’s Singles, Lynda Robbins (BC) and Jordan Kos (SK) battled hard on the greens. Robbins couldn’t quite seal the deal, going 0-3, while Kos picked up one win to finish 1-2. In the Women’s Fours, the Folkins squad of Pricilla Westlake (BC), Betty Van Walleghem (MB), Baylee Van Steijn (ON), and Alexis Gallacher (AB) narrowly lost their first match before rebounding with a win. In the final game, the Canadians came up one point shy in 17-16 match. The Jarvis squad, comprised of Shirley Fitzpatrick-Wong (MB), Joanna Cooper (AB), Fran Scott (SK), and Emma Boyd (BC), clicked right away, picking up two wins in their first two games. In the final game, the Americans had an answer and defeated the Canadians 14-9. For the full results and more information on the North American Challenge please visit: http://www.bowlscanada.com/en/hp/nac.html. Congratulations to the winners of the OLBA indoor qualifier: Dave Anderson (Silver), Patrick Cote (Gold), and Cary Lucier (Bronze). They will represent Ontario at the Canadian Indoor Championships. The Coaching & Player Development Committee would like all OLBA Clubs & Districts to consider their needs for the coming 2019 season. These needs might include Coaching Clinics for new Club Coaches. We also are looking for a club or district to host a 2019 Introductory Competitive Coach Clinic. We also are looking for Clubs & Districts to consider your player development needs. They may include Player Development Camps on various subjects such as weight & line control, strategy, all 10 basic shots, team cohesiveness, etc. We also are looking for a club to host a High Performance Camp in September of 2019. OLBA Coaching & Player Development Chair. I began lawn bowling in 1962 way back when. By the mid sixties I was totally hooked, and played everywhere I could. Some tournaments were very special, such as the Stratford M & M in August. The organizers managed to squeeze 80 teams of men's triples in a double draw,15 ends, dead ends allowed, on 18 greens + 2 greens fashioned from the "bowl" pen which was used later in the year for "patching" the main green. If you were in the early draw, you arrived by 8:00 a.m. and sometimes didn't leave until 11:00 p.m..
We all absolutely loved every minute of it. We played, waited between games and had lunch, played again, then waited by playing cards, going downtown for supper, played again, waited for the third game of the second draw to be completed, spent time with a myriad of players under shade trees, consuming the odd "beverage", and then finally went to the awards ceremony where they handed out 55 sets of prizes in order of finish. If you didn't pay for the next years event on the spot, you went on a 10 year waiting list. I miss this vision. All, but at most 10% of the bowlers from my time are now deceased. I can guarantee you most are also turning in their graves. Why? They miss the fast greens, long days of bowls, old friends, and district play downs of 32 teams per event. To win your district was huge. Only the very few even dreamed about winning a "Zone", let alone an Ontario Championship. If you did happen to win the Ontario, your new friends at the Nationals from other Provinces would say in parting "see you next year". If they only knew how impossible that was when we had hundreds of entries in an event. Back in the old days the OLBA was able to give out formal maroon blazers and pay 100% of the travel to the Nationals. They even paid your rail fare to travel to your Zone round robin back in the 50's. The Whitby Lawn Bowling Club has received an Ontario Trillium Grant to do major repairs and renovations at their club. Trillium grants are a great way for clubs to get assistance for major projects. Grants can go over $100,000. Clubs need to be incorporated to apply on their own. The OLBA can help both with preparing your grant application and incorporation. These grants are game changers for clubs and all clubs needing major renovations should consider them. Looking for Full Sized Indoor Lawn Bowling this year? I met Lloyd Woods when I joined the OLBA board for the first time in 1985. Lloyd served lawn bowling in many ways - president of the men's section of the OLBA, member on the board at Leaside for ages, the writer of our current greens manual, adviser to Bowls Canada for greens for international events and numerous other posts at the club, District, provincial and national level. Lloyd was unfailingly kind and always a gentlemen on an off the greens. He was a leader on the board in the period leading up to the merger between the men's and ladies' sections. He will be greatly missed. Looking for Short Mat Bowling? Bronze - Linda Ng - BC. will increase from $ 31.00 to $ 35.00.
to the OLBA to balance the budget for 2019.
that all members have been reported. Umpires will be assigned by OLBA. Rinks must be played on their natural and best centers. Supply Championship Chair with local accommodation information, directions to club, times for competitors to practice on the greens and social times if any. Devise a method to identify host club members so out of town visitors can ask for assistance. Contact local newspapers, radio and television, etc. with a press release. Use the Championships as an opportunity to promote your club and the great games of bowls in your community. Will be a 2day event requiring 2 greens for day 1, 2 greens for day 2 – game 1. Sixteen Women’s and sixteen Men’s teams will begin play on day 1 (pairs and singles). Day 2 will have 8 teams of Women and 8 teams of Men competing (pairs and singles). The OLBA Convenor assigned to the event will conduct registration of teams Friday afternoon and Saturday morning at 8:00 AM. Announcements will start at 8:45 AM on Saturday and games start immediately after. Day 2 games start with trial bowls at 9:15 AM. Fours may require 3 days to complete (depending on number of entries) in which case, Friday will be added. Will be a 2 day event requiring 2 greens for day 1 and 1 green for day 2 - game 1. Sixteen Women’s and sixteen Men’s teams will begin play on day 1. Mixed Pairs will begin play with 16 teams, requiring 1 green for both day 1 and day 2. The OLBA Convenor assigned to the event will conduct registration of teams the afternoon before day 1 and the morning of day 1 at 8:00 AM. Announcements will start at 8:45 AM on day 1 and games will start immediately after. The OLBA Convenor assigned to the event will conduct registration of teams the afternoon before day 1 and the morning of day 1 at 7:30 AM. Parade of Champions will start at 8:00 AM on day 1, announcements, then the games will start immediately after. Day 2 games start with trial bowls at 8:45 AM. Appoint a contact person from the club. Supply a publicaddress system for announcements. Provide sufficient number of scoreboards for all days. Scorekeepers would be welcomed. Greens must be cut prior to the start of play each day. The host club is encouraged to contact the OLBA Director for greens, for advice on preparing your greens for competition. Provide morning coffee, tea, donuts, muffins, fruit, etc. at the start of each day. Lunch will be made available at host club’s choice, players will also have the choice to buy lunch from the host club if they choose to. 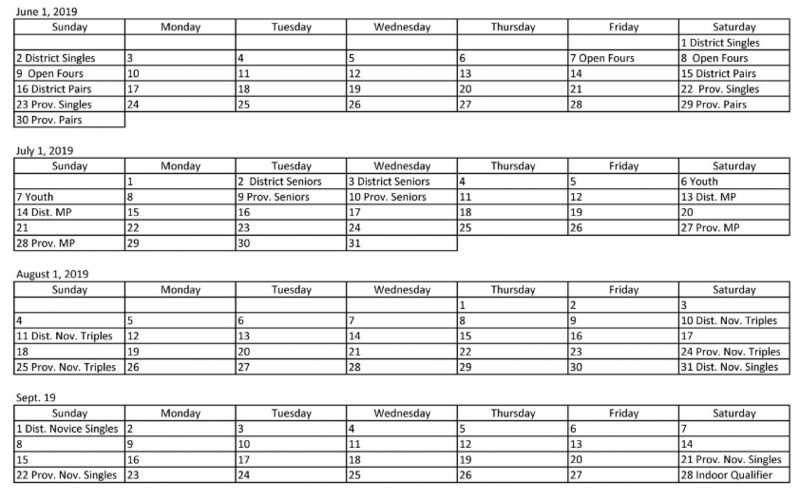 Players must contact the club to order lunch on day 1 before the championship starts if required by the Host club. Providing a program is recommended naming players, sponsors for the event, lunch menu, club information, etc. Arranging to have a first aid person in attendance every day. Provide a workspace for the OLBA convenor and an area to post results. Someone to assist the OLBA convenor in getting the display items out such as banners. There will be a parade of Champions in Youth and Novice events only. Provide a person to update the scores after each round on the OLBA website. OLBA will pay $700 for the use of a double green and $350 for the use of a single green for each Championship. OLBA will pay $50 per day for one first aid person. OLBA will pay $1.00 per person for morning snacks and coffee for players, convenors and umpires. A cheque for the greens rental will be issued before the Championship and after the Host Club financial report has been submitted to the treasurer, a cheque will be issued for the balance. OLBA will pay $100.00 for a piper for the Youth and Novice events only. Any other expenses must be approved by the Championship Chair beforehand, no exceptions. Parade of Champions for Youth and Novice Championships only. Welcome by the Host Club Spokesperson. O Canada should be included. Introduce the OLBA Convenor assigned to the event for his/her announcements. Introduce the Head Umpire for his/her comments on the rules for the competition. Need a weekly fix of bowling news? Want to stay informed on all the Bowls Canada Boulingrin news. Disclaimer:The information and articles provided in this email represent the opinions of the articles author and should not be considered as endorsed by or policy of the Ontario Lawn Bowls Association OR it's Directors.